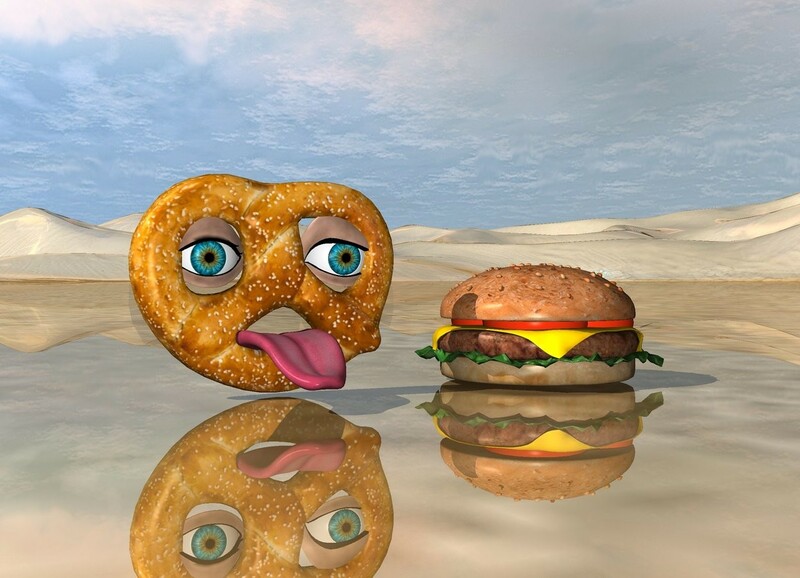 Input text: the large tongue is in front of the large pretzel. it is 1 inches above the ground. the large eyeball is two inches above the tongue. it is behind the tongue. it is -1.3 inches left of the tongue. the second large eyeball is two inches above the tongue. it is behind the tongue. It is -.5 inches right of the tongue. the ground is shiny. the large hamburger is 3 inches right of the pretzel. such a tantalizing tease, I can't wait!!! oh yes! the meat free burger grown in a lab ! There are about 120 new objects coming soon...thought I'd post a preview :-) It will be really interesting to see what everyone does with them! and believe me we can't wait to see what we can do with them either!!! I like the burgers in this place. Yes, very tasty looking models! It has an uncanny similarity to E.T. I knew there was something about that character !! !